Project aims to standardize wind-turbine information in Canada. At the end of 2015, Canada had commissioned more than 11,000 MW of wind-power capacity, and even more wind farms will be coming online in the coming years. Although the wind industry supplies approximately 5 percent of Canada’s electricity needs, to date it has not benefited from a broad and consistent understanding with respect to its performance, especially when compared to data that is available for traditional forms of energy. While some sources of information do exist with regards to wind-energy data, these tend to conflict with each other and typically underestimate basic details such as tracking current installed wind-energy capacity. With the current federal and provincial focus on climate change, it is increasingly important to have access to reliable and consistently produced baseline data for renewable energy — in particular wind energy — which is one of the fastest growing sources of new electricity in Canada. Moreover, as wind parks transition from construction to operation and maintenance, the need for comparative statistics also increases. Power generation is a competitive business, and when electricity prices are low, wind energy has extremely low margins due to lack of fuel costs. So it is critical to track all causes and occurrences of downtime to direct process improvements and forecast future expenditures. The Canadian Wind Energy Association (CanWEA), along with CanWEA members who are wind-farm owners and operators throughout Canada, have recognized the need for standardized reporting to support wind-industry internal benchmarking, preventative maintenance, and research. In 2014, CanWEA initiated a pilot project to collect key performance indicators from wind-turbine owners within the CanWEA membership. There is a precedent for this type of wind-energy data collection in other countries — for example, SPARTA, which is run by private companies in the UK, and CREW, which is run by Sandia National Laboratories in the U.S.
CanWEA has non-disclosure agreements for data collection with CanWEA member wind-turbine owners and operators who comprise 30 percent of the installed wind-energy capacity in Canada. Canadian wind-turbine owners and operators who took part in this pilot study agreed to adopt the existing Generating Availability Data System (GADS) format, which is a program developed by the North American Electric Reliability Corporation (NERC) that acts as a database where all conventional electricity generators with plants of greater than 20 MW capacity contribute. This format was selected not only because the document is well-prepared, but because NERC soon will require wind plants 75 MW and larger with a commissioning date of January 1, 2005, or later to report their performance and availability metrics. GADS data has been used for other types of generation for reports that provide industry and policy makers with a quantitative baseline of the distribution, capabilities, and status of that generator type. While GADS data for wind farms will be collected by NERC, it is unclear what information will be available for research. For example, with regards to the Electricity Supply and Demand (ES&D) database, NERC collects, maintains, and annually publishes its data, including 10-year projections. However, there is little interpretation or analysis. Rather, the data is presented “as is.” While these data are useful, their utility is limited to system planners and a select few researchers. Therefore, policy makers and individual owners are expected to have a more challenging time with regards to unlocking the full value of NERC-published data for their own purposes. The Wind Energy Institute of Canada (WEICan) has recently taken a leadership role in the pilot phase of this project, working with CanWEA in collecting, integrating, aggregating, and analyzing data from 28 wind farms across Canada from 2014 and 2015, which comprised approximately 13 percent of the installed wind capacity in Canada. Participants receive a yearly report showing how their wind farms’ performances compare to the Canadian average. All data is confidential, and representative data is used for public reports. This project is helping to establish a standard for wind-energy data collection and analysis in Canada. The data collected as part of this project has the potential to provide insight into wind-farm performance and availability to CanWEA, wind-turbine owners and operators, government officials, and research laboratories. There are many possible benefits from the consistent, reliable and aggregation of wind production and availability data in Canada. From an owner’s perspective, these data will allow individual companies/owners to benchmark their performance and direct preventative maintenance. These data can also aid CanWEA and the broader wind industry with respect to external communications with various stakeholders (for example: public, government, and utilities). While policy makers do not have access to this data currently, it is clear that access to aggregated baseline wind-energy data could help inform climate-change discussions and could be used to support future energy research related to the wind-energy industry within Canada. It is hoped that as the dataset grows and its value is demonstrated, more CanWEA members who are turbine owners and operators in Canada will elect to be part of this program. One of the main functions of the program is to help wind-farm owners benchmark their performance. The ability to benchmark performance and direct maintenance efforts using GADS is heavily reliant on the data structure. In this project, operators submit data to WEICan, and outages are sorted into 132 codes, ranging from catastrophic gearbox failures to burnt-out tower navigation lights. The 132 codes are then distilled into 15 categories with broad classifications such as electrical and gearbox. Downtime and occurrences also are split into three categories: planned, forced, and maintenance to provide a refined look at outage types. Participants in the program are provided reports based on the 15 categories, which compares their individual outage occurrences and downtime per category with the average of all data submitted. Comparisons are made on a per-megawatt basis and on a per-turbine basis to make accurate and useful comparisons between turbines of different sizes. Other indicators such as capacity factor, availability, and site conditions also are compared. Examples of plots that are part of these reports are shown in Figure 1 and Figure 2, where representative plots showing outage hours per megawatt and outage occurrences per megawatt are shown, respectively. In these plots, the relevant values are shown for each of the 15 categories for each wind farm, with the average value and the site being reported individually highlighted. Based on the reports, wind-turbine operators will be able to see where their turbine fleet is excelling or falling short in terms of maintenance requirements and outages compared to other wind farms taking part in the project. As the number of participating parties increases and multiple years of data are accumulated, the value of trends, performance benchmarking, and overall accuracy of the dataset will improve. While much of the wind-energy capacity in Canada has been commissioned in 2009 or later, a significant number of wind turbines across Canada are either off warranty or will be coming off warranty over the next number of years. In addition to the growing fleet of operating wind turbines in Canada (6,000 and counting), provinces are expected to slow down procurement of more wind projects for at least a few years. During these times, the GADS data collection program will be important as it is prudent for the wind industry to make rational and timely investments in operations and maintenance activities, which includes, among other things, collecting performance metrics (for example: production, availability, and outage data). It is expected these data can be used to support internal benchmarking and decision making, and they can help ensure investments are made appropriately in long-term operations and maintenance activities. As the database for GADS expands year-after-year, trends will begin to emerge for downtime and occurrences for wind farms. Along with the data collected from owners and operators’ internal programs, correlating the outage trends found in GADS to maintenance expenditures will help wind-farm operators forecast their maintenance costs for their fleet. Having this knowledge will then aid operators in estimating the actual economic service life of their fleet rather than relying on the approximately 20-year life typically quoted by manufacturers, but that has yet to be broadly tested in Canada. Economic service life differs from mechanical life in that it takes into account the running costs of the plant and allows the operator to determine when it is most cost effective to decommission the existing fleet and take on the capital cost of new turbines to replace the existing turbines, as opposed to continuing to maintain an aging fleet with presumably out-dated technology, whose O&M costs will only continue to grow. The operators should then be able to direct their efforts at a specific group of turbines that seem to be problematic or direct their efforts toward improving, for example, the reliability of the pitch system on their entire fleet of turbines. Given the Canadian government’s renewed emphasis on data-based decision-making, the Canadian implementation of GADS could become an extremely important tool for energy and environmental policy. As the number of wind farms participating in the Canadian performance and availability benchmarking data pilot increases, a clear, data-based picture of the Canadian wind industry as a whole will begin to form. CanWEA is considering making project data available to policy makers as part of an expanded program going forward. With the current focus on climate change, the aggregated project data would provide policymakers with an accurate baseline of renewable energy in Canada. Additionally, when the aggregated data from this work is compared to GADS results from traditional generation methods such as natural-gas turbines, it would allow policy makers to make direct comparisons of generation methods and base their policy on an impartial and standardized data source. Although each wind farm results in less than 20 data points in this work, the data arising from multiple wind farms across Canada over several years provides many rich research opportunities. CanWEA also is considering making project data available to research organizations other than WEICan as part of an expanded program going forward. Access to such aggregated data would allow researchers to take a deeper look into trends, beyond the aforementioned reports. Factors such as seasonal effects, turbine size, turbine age, and provincial differences could be examined. When these data are correlated to other data sources, such as condition monitoring tools and weather/climate characteristics, it could be used to develop tools to help determine the service life of the turbines. Owners, operators, and the Canadian wind industry can benefit from compiling detailed baseline availability data through an established format, such as GADS. These data will continue to be collected and analyzed for wind farms in Canada with aspirations to have all wind farms report. The wealth of data obtained will be critical to ensuring an informed view of wind energy, helping demonstrate the economic viability of wind power in Canada, and help continue to increase the market penetration of this renewable resource. WEICan is a not-for-profit, independent research institute whose mission is to advance the development of wind energy across Canada through research, testing, training, and collaboration. With federal funding from the Department of Natural Resources’ Clean Energy Fund, the Institute has built a state-of-the-art $25 million, 10 MW wind park with a 1 MW/2 MWh battery energy storage system. 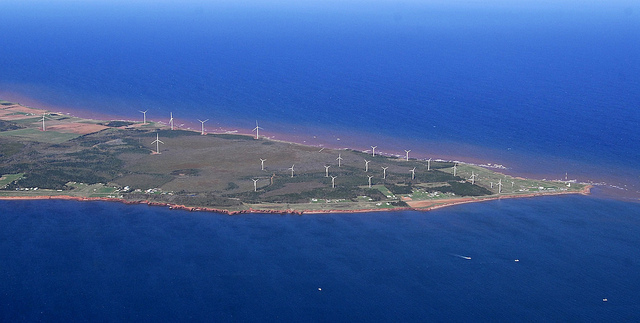 The Institute’s site has a strong wind resource and a 300-degree exposure to the Gulf of St. Lawrence, which allows for relatively low turbulent winds. Marianne Rodgers is the scientific director at the Wind Energy Institute of Canada. She can be reached at marianne.rodgers@weican.ca. Alexander Medd is a wind systems intern at the Wind Energy Institute of Canada. He can be reached at alex.medd@weican.ca. Thomas Levy is a senior wind engineer at CanmetEnergy Ottawa, Natural Resources Canada. He can be reached atthomas.levy@canada.ca.